Dave’s love for Maine extended into every season – I don’t think I ever even heard him complain of “mud season” (most of the wet spring and fall that ends up making that whole area a muddy mess). While summers were filled with fishing, boating and kayaking, winters were reserved for snowmobiling. Our trips always started with a debate about who would ride which snowmobile. My dad ALWAYS picked the Yamaha, which was the fastest, but didn’t have a reverse. When we were younger, Dave and I usually had to share an Arctic Cat two-seater. So, if I was feeling gracious, I’d let him steer first, clinging to the back. Sometimes, I started us up. As the passenger you were pretty much at the mercy of the driver and it could get pretty turbulent back there. Dave would torture me by going too fast and hitting the snowbanks for a little air, till I maniacally slapped him on the back when I was about to fall off. I would torture Dave by taking the curves on the trails too tight, occasionally landing us in a ditch. Somehow, that was my specialty. Once we got older, a third machine was added. From then on Dave landed in a ditch with me much less often and usually just had to help me dig mine out when I got a little too wild. — I hit 87 mph! — Oh yea?! I hit 91! 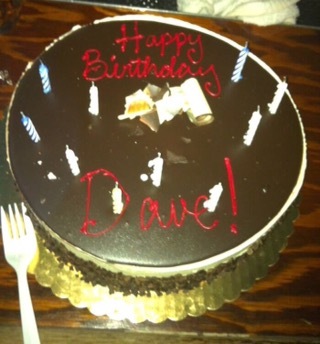 Sometimes the numbers got a bit outrageous… as in, I’m pretty sure Dave exaggerated! After our little break, we’d settle on a place to head to for a real meal, eating calorie-laden delicious comfort food, our dad sipping a cold beer. Then we’d gas up the snowmobiles and head right back on the trails. Sometimes we’d be on the trails long enough that we’d have to ride back in complete darkness, which was always a bit disconcerting, but also utterly beautiful with a clear night sky overhead. Sometimes, we’d be hit by an unexpected snowstorm, limiting our visibility to almost nothing and making us slow down to a few mph until the weather cleared again. No matter what, it was always a good story later! People tell us that they admire our strength. Honestly, I don’t feel strong. I don’t think my parents feel strong either. Many days we’re not quite sure how we made it through. In the early weeks after Dave was killed, my mom would say that she didn’t know how she was breathing, and we all knew exactly what she meant. Now, things are a little more manageable. It’s so hard to put into words what life is like now. My life looks, mostly, “normal.” I walk my dogs. I shop for food and cook. I go to the gym. I attend classes, run data analyses, teach, have meetings and write reports. So, anyone looking in would see a busy grad student. But, mostly it feels like a facade. Just underneath the surface, more often than not I’m thinking about what happened on March 1st, about how long it’s been, about missing Dave. There are constant reminders of him everywhere I look. If I see a patrol car pass, I wish I could talk to the officer – to feel closer to Dave’s experiences, to thank the officer for doing their job, to talk to someone who knows on some level what all of this means (so far, no luck — I’m much too boring for the police to pay attention to me!). When I see a bird of prey overhead, I remember how much he loved them. He could identify the exact type of bird by their outline as he watched them from below. When someone mentions their sibling, I feel a knot in my stomach. When I see something ridiculous, I hear the joke Dave would have made. Sometimes, I manage a chuckle. Spending time with my family and people who knew and loved Dave is the time when I have permission to let what’s under the surface come to the forefront. In those moments, with those people, I can just be in that grief – however it may express itself. Instead of pushing my thoughts and feelings to the side, I can let them come and go. The best part is, everyone understands. I think that in allowing myself that time, I can work on building myself up again. So, whatever strength I have is coming from the love and care around me. The grand gestures aren’t what makes this easier — it’s the little reminders that you’re thinking of us: the random texts to say hi and the absurd snapchats that are best forgotten soon after opening. It’s the clever, gritty jokes that remind me so much of Dave’s sense of humor. It’s getting made fun of for being a “tree-hugger” or “super-liberal” (I imagine a cape-wearing superhero). It’s the little tributes to Dave that pop up regularly on Facebook, or just new comments on old posts. I see you think of him and of us, and I know you’re sharing our burden. So, we may not feel strong, but I guess we’re still standing, still taking one step at a time into, hopefully, brighter days ahead. We’re doing what needs to be done, and we’re doing it with you by our side. So, thank you. Today, you would have been 30, baby bro. Today, I should have been able to call you and sing you an atrocious rendition of “happy birthday.” I should have been able to tell you that you’re officially old, and you should have been able to tell me that I’m older still. I should have been able to tease you about having to look out for those hangovers that would all of the sudden start, probably even with that night’s celebration. I should have been able to welcome you into one of the best years of your life: a year where you and your love would have had your beautiful wedding day with all your “best buddies” (since you could never restrict yourself to only one best man); a year filled with Mickey’s shenanigans in your newly renovated first home; a year where you FaceTime me from your fire-pit, a glass of whiskey and stogie in hand, just to show me how amazing your pool looked and to tell me that life is good; a year of constant requests to come visit again, or you know, to just move to Texas already; a year of texts to show me the newest smoker experiment and, probably, tell me there’s Fireball in the marinade; a year of super-impressive dubsmashes and wildly inappropriate, yet surprisingly artistic, snapchats; a year of random much-too-generous gifts for the people you loved; a year of ridiculous German accents and impressions; a year of gym selfies showing off your “godlike physique” and updating on the circumference of your biceps; a year of spreading only the biggest laughs and the deepest care. We should have been able to tell you to have an amazing day celebrating, envisioning only the most wonderful things for you. Instead, we’re left with only the memories that have already been written. You are so, so loved. And, you are so, so missed. The amount of love you have generated in others is beyond comprehension. If we can achieve the same in our lifetime, we will have done well. Today, we’ll raise our glasses to you. We’ll cry for you. We’ll laugh for you. And, most of all, we’ll try to live our lives a bit more like you did, ’cause let’s face it: you had this living-thing down.